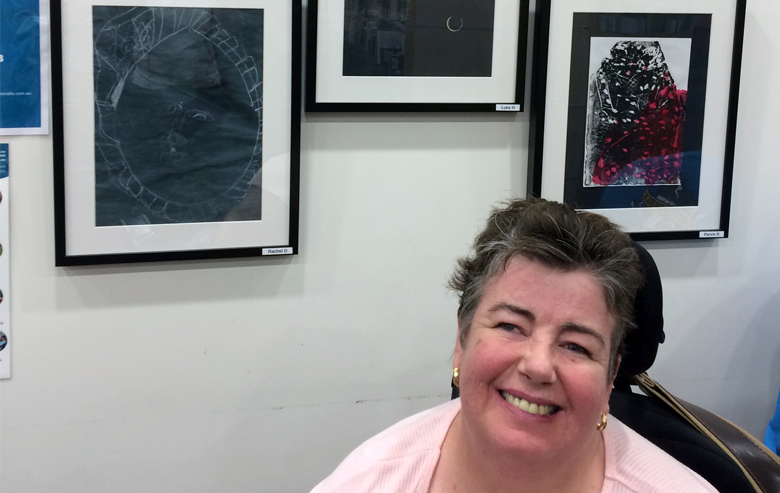 Yooralla customer, Debra (pictured), said she was supported by the Arts program to bring her vision to life. A collection of artwork produced by a group of Yooralla customers is currently being exhibited at the Sydenham Library. Customers from the St Albans Community Hub spent weeks putting the collection together as part of the Hub’s art program. Deo Jr Vinola, Service Leader at the St Albans Community Hub, said the program’s art teachers manage to draw out the artist in every participant. “Art is one of the most effective media to express one’s self – emotions, thoughts and energy. It caters to all, no matter the level of abilities, physical or otherwise,” he said. This year, the Hub has expanded its creative programs to also include ‘Crafts’ on Mondays, ‘Mind, Music and Many More’ on Tuesdays and ‘Creative Homes’ on Thursdays. Yooralla customer, Debra (pictured), whose work is part of the collection, said she was supported by the Arts program to bring her vision to life. “My painting was inspired by me thinking about climbing a mountain. The Arts program allowed me to do my own thing. It was great!” she said. Rachel, another Yooralla customer whose work is also exhibited, said that the Arts program at the Hub “is great for me to create whatever I want”. “My piece of artwork that is exhibited was inspired by the Queen. I have drawn the face of the Queen,” she said. Yooralla has Community Hubs across Victoria, where people with disability can receive the support they require, meet new friends and get out in their local community, all while learning new skills. Read more about Yooralla's Community Hubs and supports.